Eighty years after the operation to provide safe haven for 10,000 unaccompanied child refugees, how should the Kindertransport be remembered? 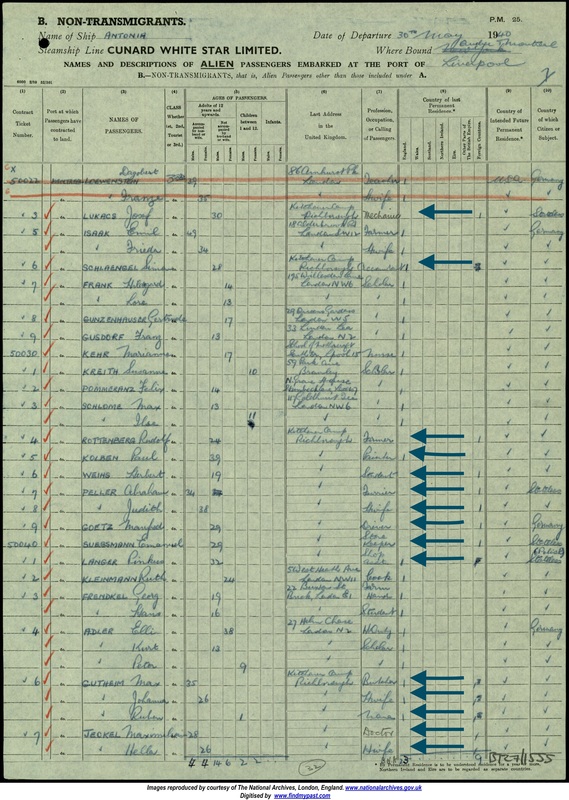 This is a significant question for Kitchener families – in part because the two schemes were organised and funded by the same people and institutions; in part because some Kindertransport boys ended up at Kitchener camp for some weeks; and in part because some Kitchener men’s children were on the Kindertransport. In other words, there is significant overlap between these two rescues. At Remembering & Rethinking: The international forum on the Kindertransport at 80, the question of how the Kindertransport should be remembered will bring together experts, eyewitnesses, and stakeholders from numerous countries. This landmark event, co-sponsored by the Association of Jewish Refugees (AJR) and the UK Special Envoy for Post-Holocaust Issues, The Rt Hon. the Lord Pickles, will take place from 15-16 April at Lancaster House in London. The forum aims to build bridges between scholars, educators, practitioners, policy-makers, and those who may have a more personal or tangential interest in the subject. Speakers include journalist Hella Pick; Mark Hetfield, President of HIAS; noted psychiatrist Professor Sir Simon Wessely; and representatives from international educational and remembrance institutions. Rethinking the historical narrative – With the UK engaging in a government-led process that will shape Holocaust memory for the next generation and beyond, the forum will provide a platform for scholars whose work highlights the refugee experience in all its historical complexity, helping to establish its central place in the British narrative. Putting ‘remembering’ into practice — The present day refugee crisis represents a clear example of how an understanding of the events of the 1930s and 1940s can and should inform policies and attitudes today. The international forum will address the contemporary relevance of the Jewish refugee experience and hear the voices of experts on this subject. Highlighting good practice – The AJR is the UK’s largest dedicated funder of Holocaust educational and remembrance programmes. In this capacity, we promote innovation and impact-led programming within Britain’s leading Holocaust education and remembrance organisations and beyond. The forum will provide an opportunity for institutions to network and showcase their output for the benefit of domestic and international counterparts. 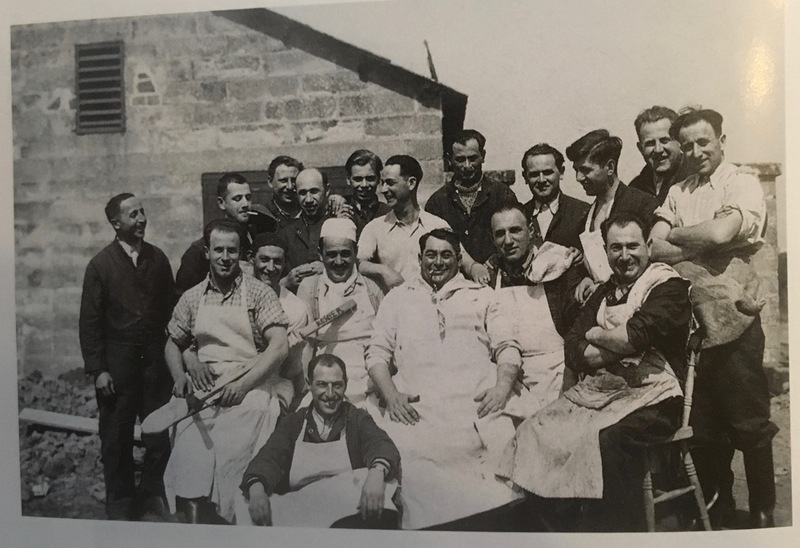 Some wonderful images of Kitchener cooks have arrived – from the family of Kitchener camp’s ‘Chief Cook’ Jack Agin (see the 1939 Register – he seems to have taken over from Bruno Ottner). If you recognise anyone in these photographs, please get in touch so we can pass on the information to Jack’s family. Kitchener camp, Jack Agin, Cook, 1939. All welcome – looking forward to seeing you! You may recall that not long ago, Dr Helen Fry came to talk to us about the involvement of around 900 Kitchener men in the Pioneer Corps. If you would like to know more – or if you were unable to join us on that occasion – another opportunity to hear Helen is fast approaching. 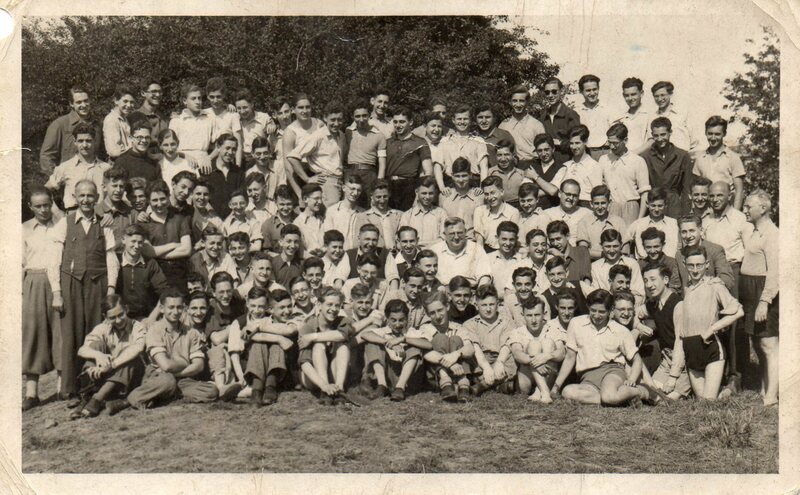 The Second Generation Network, together with the Wiener Library, have invited historian Dr Helen Fry to speak about her research into the 10,000 German Jewish refugees who fought for Britain in the armed services or the secret service during World War II, and the establishment of a museum at Trent Park, home of the secret listeners. There will be a discussion about the feasibility of fundraising for a memorial in recognition of their contributions to the war effort. Attendees are encouraged to share their accounts (and memorabilia) or those of their relatives who were in the armed services, the secret service or otherwise helped the war effort. A beautiful hand-drawn wedding card was sent to the project some months ago, and a very kind researcher has now translated it for us. The card is particularly notable for the scenes depicted along the sides – of typical Kitchener tasks. The ‘poem in a card’ to mark a birthday or wedding seems to have been popular among German families – my father always wrote a short piece of light-hearted verse in my birthday cards. Apart from the fact that this wedding card is a wonderful item – for all kinds of reasons – the men who made the card for the happy couple also list their surnames on it, and note the fact that they were residents in Hut 23/I. In what follows, I have cross-checked the surnames against the 1939 Register. Although some of the surnames are too commonly found to draw any conclusions (I don’t make any suggestions where there are more than two possibilities), a good number appear only once in the Register, and thus it seems reasonable to suggest that the men of Hut 23/I are as follows, below. If your father or other relative was in Hut 23 and you can shed any more light on this list, we would be very pleased to hear from you. 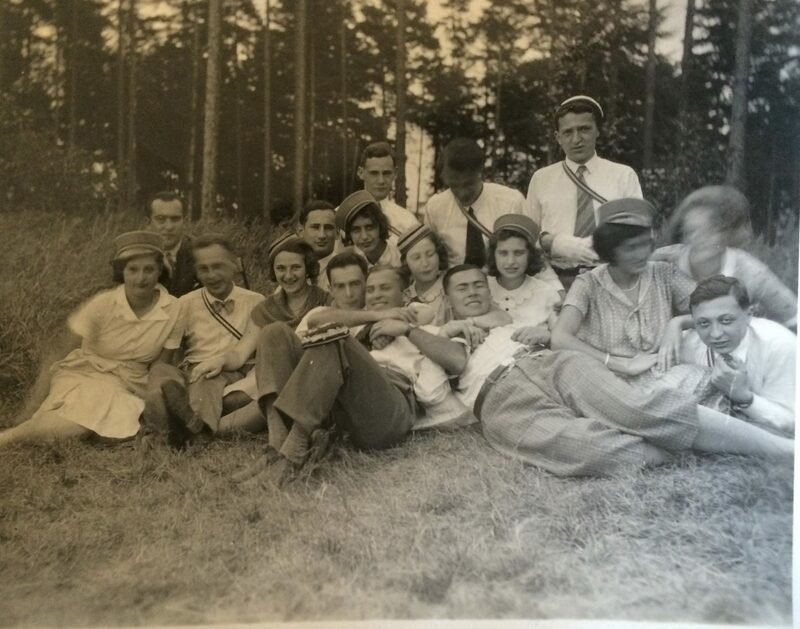 I mentioned in a recent post that Werner Weissenberg was a member of the Jewish fraternity at Breslau (the Kartell-Convent) – and that Lothar Nelken, the father of Stephen, who started the Kitchener gatherings with Clare Ungerson, was in the same fraternity. 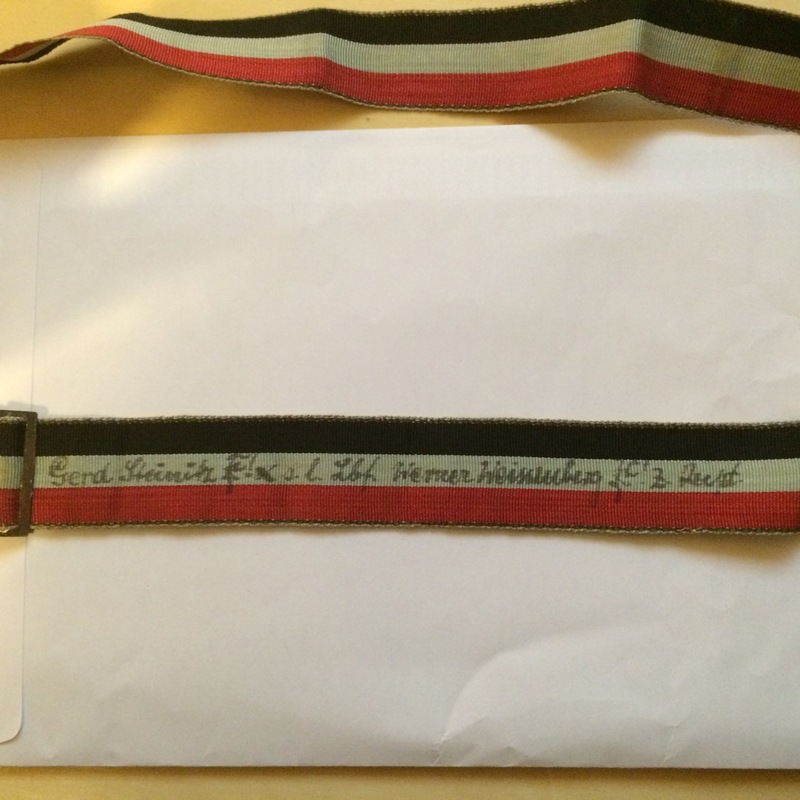 If you believe that your relative was in a Jewish fraternity in Germany or Austria (in the Jedidayah/Yedidayah, for example), or in a German or Austrian Jewish training school, or in the Maccabis/Makkabis, or some similar group, please be sure to let us know. It is a painstaking task, because the 1937 Kartell-Convent handbook has many names on many pages, but as an example, I have cross-referenced a handful of men who were in the Kartell who are also listed in the 1939 Register for Kitchener camp. I have triple checked, in a sense, because finding a name match is not sufficient to tell us that an apparent match is in fact a match, so I have also checked the Exemption from Internment cards online to match city of birth and occupation. This takes a while, as you might imagine! The following information is in publicly available records online; the records are over 100 years old. On this subject, we have recently received an incredible amount of information about the Berlin ORT boys, and as soon as I have some time I will be uploading this. With membership of this training school, of course, we absolutely know it was the reason that over 100 people came to Kitchener camp. 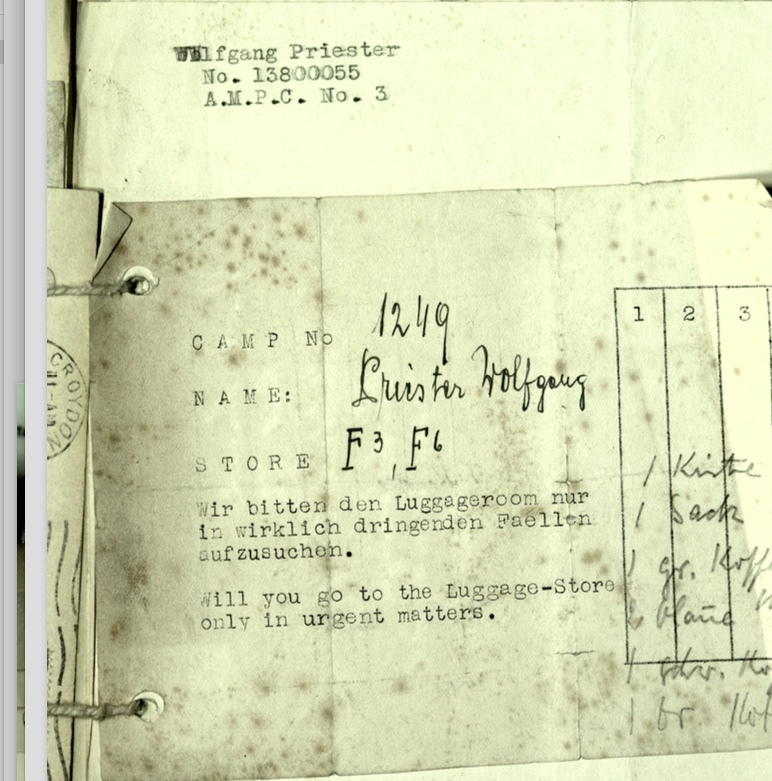 We have started to email out letters to contributors to this Kitchener project, asking permission to draw on the photographs, letters, and documents that are viewable across this website – so that we can incorporate some of them as part of an exhibition on the Kitchener camp rescue. As you will know, we have always intended to hold an exhibition day this year, to commemorate 80 years since the Kitchener rescue – and this is what we are now turning towards pulling together. 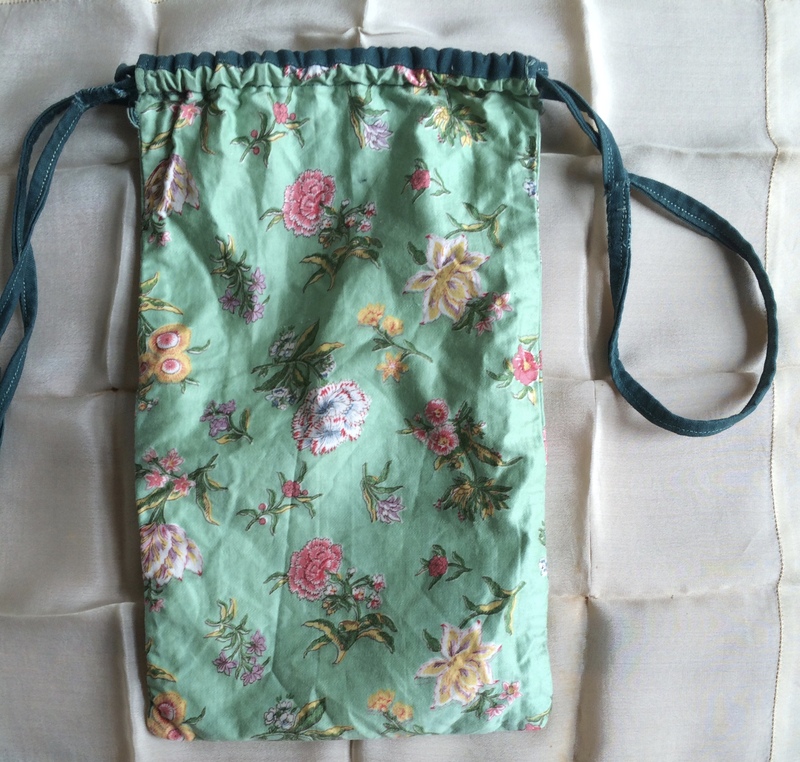 We cannot and will not use items in the exhibition if we don’t have your express written permission for this use. If you don’t want to have your images as part of the exhibition, it’s absolutely fine. You should not feel under any pressure whatsoever to agree if you’re not happy with it. Some families love the idea, but it won’t be for everyone – which is why we are asking this specific question. The letter we are sending out to all contributors over the course of this week is a separate permission to the one you signed to contribute to this website project. It is separate because the exhibition will be a different kind of presentation. As you will appreciate, once images have been incorporated into a six-foot banner stand, with many other images and text, it will not be possible to remove an image or images later on. As you will also know, we are not a formal, funded body – but a loose group of Kitchener ‘descendant’ families who have come together with our small and not-so-small family archives to re-build the history of this extraordinary Kitchener rescue of thousands of Jewish men, and some women and children. It is a history that had largely been forgotten. Because we are not funded, we are very much dependent on an institution stepping forward to effectively donate a space for this event. This is no small ‘ask’ on our part: central London is incredibly expensive for event space, and our ‘ask’ is for a venue that would usually cost thousands of pounds for a day’s hire. So, while we understand that excitement is building – especially from families living overseas – please be patient with us just a little while longer, and please ignore any dates you might have heard on the grapevine – because *nothing has been fixed yet*. As as soon as we have a date and a venue arranged, you will absolutely be the first people we tell. What is a Travelling exhibition? There wouldn’t be much point going to all this trouble for one day’s exhibition – however enjoyable we hope the day will be. The exhibition will thus be ‘mobile’ – a travelling exhibition – and we hope there will be a good amount of interest from many institutions to host it in the future. We are getting good vibes about this from quite a number of places, and look forward to many more people learning about the Kitchener rescue in future, as they have learned, for example, about the Kindertransport to date. As you know, we are donating the Kitchener project to the Wiener, and the exhibition will also be donated into their care for the future. The impressive Washington-based USHMM also produces travelling exhibitions, and info about this can be viewed here: https://www.ushmm.org/information/press/press-kits/traveling-exhibitions. Having pointed you at the latter example, it is worth bearing in mind that USHMM has federal funding and there is no equivalent state investment in Holocaust education in the U.K. of which I am aware. Even the small but highly influential Wiener Library runs mainly on private funding and donations, as I understand it, so we hope this puts into perspective what we’re trying to achieve in relation to Kitchener camp. Coming this far this fast with the project has been both utterly unexpected and an incredible experience for everyone involved, I think – and many more people have now heard about the Kitchener rescue than was the case even a couple of years ago. But for this to become part of our national narratives about the Holocaust still requires much good will and the ongoing, considerable support of our many Kitchener families. So – whether or not you are comfortable with your images being part of the exhibition, we sincerely hope you will be part of it, if you can, by joining us on the day. And we promise to update you about the details as soon as we have them! In the meantime, please watch out for the exhibition permission letter arriving in your inbox. It is as simple and straightforward as the one for the website, we hope, but is specifically for the exhibition, rather than the website. Kitchener Camp, from the Julius Gildener family collection – does anyone know who these children are? While news about Kitchener continues to spread – ‘getting the word out’ is a painstaking task. One of the difficulties is that many families don’t know anything much – or at all – about the Kitchener rescue, so they are not even searching for information about it. Somehow, we have to find them. It’s always fantastic when folk take up this baton and people’s ingenuity and enthusiasm keep pushing the project outwards. It’s amazing to hear about networks of family, friends, and colleagues spreading the word. The latest we’re hearing is that B’nai Brith International, which so kindly put out a free advertisement for us last year, has now commissioned a writer to do an article about the Kitchener history. Many thanks indeed to B’nai Brith for your continuing support! And sincere thanks to a Kitchener man’s son for doing the work behind the scenes to make this happen. I mentioned a little while ago that a Kitchener group was hoping to coordinate to meet in the USA and that is now going ahead. If you live ‘locally’ and would like to be put in touch, please let me know. The US meet-up includes a talk from Frank Mecklenburg, Director of Research and Chief Archivist at Leo Baeck Institute (I’m hardly jealous at all!). There are some smaller meet-ups being arranged among those living too far from NYC to attend Frank’s talk. We’re also hoping to meet some US Kitchener families when we hold our exhibition later this year (watch this space for details!). Some folk we will be meeting for a second time, as a number have already flown over for various events and some come over just to say hello – it’s an incredible experience for everyone involved. Please do check the group photographs page from time to time, in case you spot your relative. 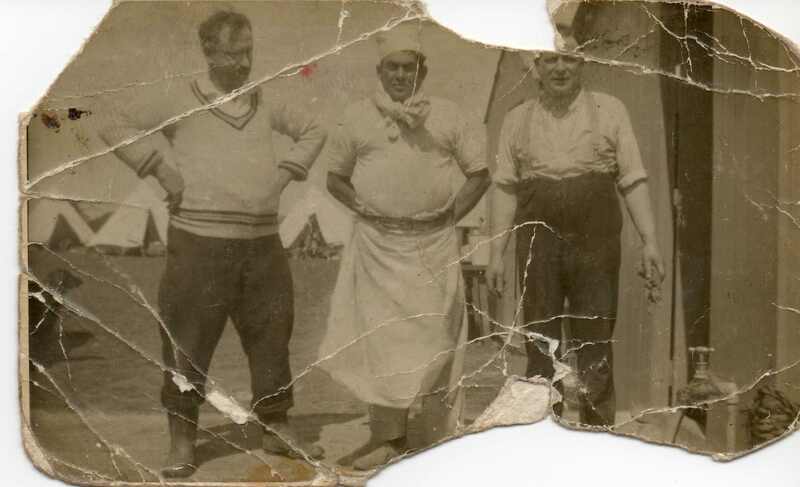 And please let me know if you recognise someone, so I can tell the family who is in the photograph with their relative. One American gentleman asks whether anyone has seen an image of his father in their photographs from this time – he is pictured below during his stay in Britain. 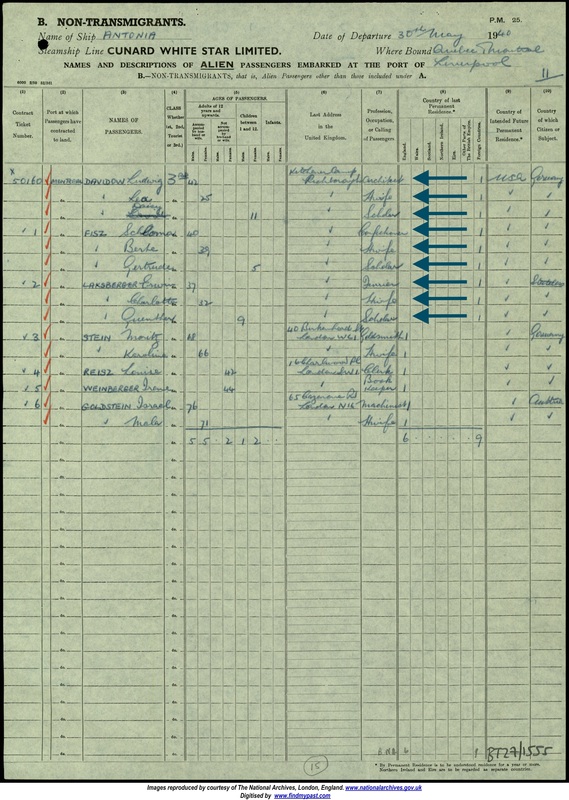 According to British National Archives records, Alfred Frisch was born in Rostock in 1908. He was interned in Britain in summer 1940 – as were so many thousands of Kitchener men. He was released without restriction in summer 1941. If your father or grandfather was interned in Britain, you might like to join us at the Wiener Library for a talk on the wartime internment of Jewish refugees. We are meeting at the Wiener Library in London on 11 April – from 6pm for a 6.30pm start. A very kind person from Leeds Civic Trust, with whom we are in conversation about permission to use some Berlin ORT images, has kindly mentioned that there is a programme on BBC 4 at 9pm this evening in which some Kitchener families may be interested. “Film-maker Simon Glass explores his family history and tells the story of the Yorkshire Jews in the early 20th century. Thousands of migrants arrived by boat on the east coast of England and lived in a run-down slum area of Leeds known as the Leylands. Simon discovers stories of hardship and anti-Semitism, but also success and progress as many Jews moved out of the Leylands to the more affluent suburbs. He also travels to eastern Europe where he makes a shocking discovery about what happened to his relatives who did not migrate to Britain” – source BBC 4 website. I don’t have a TV, so if someone can record it (legally), it would be very much appreciated. All welcome – looking forward to seeing you there – do come and say hello! With the outbreak of war in 1939, all Germans and Austrians resident in Britain became ‘enemy aliens’. The British government instituted a series of tribunals to ascertain which enemy aliens were ‘dangerous’ and which were refugees. Many families will have seen their archived tribunal cards, headed Exemption from Internment – but please get in touch if not. With the swift fall of France and the Low Countries in May 1940, public hysteria led to calls for mass internment in case there was a ‘Fifth Column’ of foreign spies and saboteurs. However, the vast majority of those interned in Britain during the War were refugees who had fled religious or political persecution before the war. Arrested by the police, sent to hastily constructed transit camps at racecourses, unfinished housing estates, or in one case an abandoned factory, and then moved to the Isle of Man, Australia, or Canada, internment was a traumatic experience for those involved. 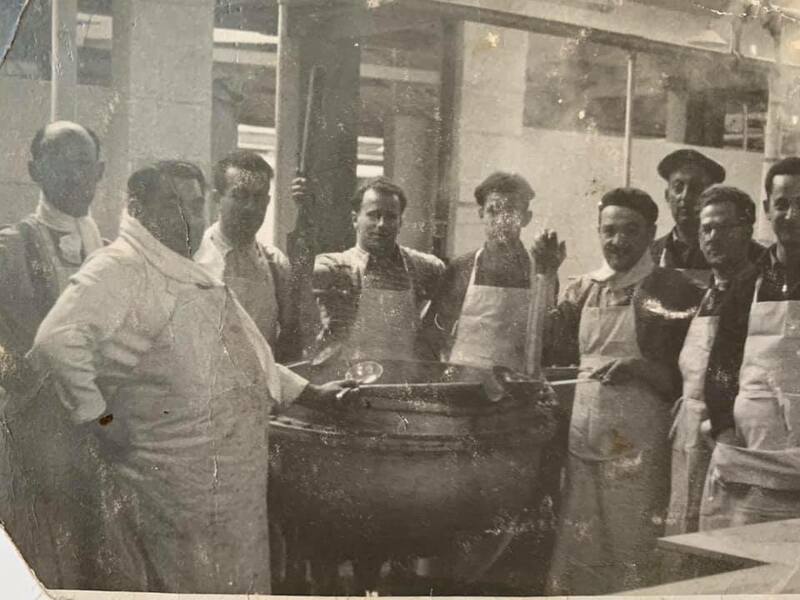 Additionally, those who wanted to fight against Nazism were initially denied this opportunity, leading to much frustration, as well as unnecessary hardships caused to individuals and families already suffering displacement because of Nazism. Almost as soon as the policy of mass internment began, it was decided to reverse the policy because of the numbers of refugees involved. Campaigns by refugee charities, prominent MPs, and public discovery of the most controversial aspect of internment – transport abroad – led to the start of the release process. Release was often slowed by bureaucracy and was significantly more challenging for those internees who had been deported to Canada and Australia. Yet, despite all these trials and tribulations, the internees made the most of their situations and created thriving environments despite their lack of resources. This talk will explain the policy of Second World War internment in Britain, life in the camps, and the experiences and memories of former internees. Dr Rachel Pistol is based at King’s College London, working on the European Holocaust Research Infrastructure (EHRI). Prior to this, she was at the University of Exeter, where she remains an Honorary Research Fellow, and Royal Holloway, University of London. Her first book, Second World War Internment, was published by Bloomsbury in 2017. She completed her B.A., M.A. and Ph.D. at Royal Holloway under the supervision of the late David Cesarani, OBE. Rachel has appeared on TV and radio for the BBC and Sky News and has been interviewed for various television documentaries on Second World War history. She has written articles for The Conversation that have been reprinted in Newsweek and The Independent, and blogs for Huffington Post. 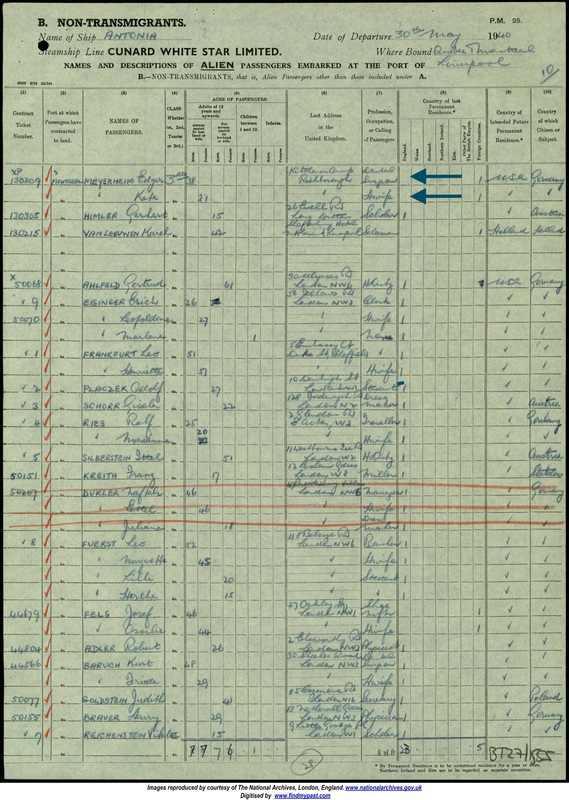 We don’t yet know how many managed to reach Canada and the USA between September 1939 and summer 1940 (figuring this out is a work in progress), but many hundreds of Kitchener men will have been interned. Some were sent overseas, as we know – to Canada and Australia – and some were interned here in the UK, in Warth Mill or on the Isle of Man, for example. We haven’t yet received very much information from families about internment – especially in Britain – and would very much like to hear from anyone whose father was in Kitchener and then interned – in Britain or overseas. 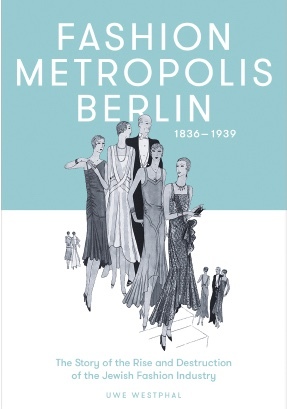 Journalist Uwe Westphal’s Fashion Metropolis Berlin, 1836–1939: The Story of the Rise and Destruction of the Jewish Fashion Industrywill be published in German and English in March 2019. It charts the rise of the Jewish fashion industry in Berlin and its destruction at the hands of the Nazis – through Aryanisation, theft, and persecution. Dina Gold, whose family once owned Berlin’s largest international fur business, has been working with Uwe. She has written a chapter in his book charting the history of her family’s fashion company, the 1937 forced sale of the building it was housed in, and her battle for restitution beginning in 1989 after the fall of the Berlin Wall. Uwe and Dina have already presented to audiences in the USA on this topic and they are now interested in acquiring some samples of pre-war Jewish German manufactured fashion items to be shown at lectures in conjunction with the launch of the book. They hope that children and grandchildren of people who found refuge in the UK and who have articles of clothing as well as company labels, coat hangers, letterheads, model drawings, photographs/film footage of fashion shows, workshops or shop windows from the 1920s and ’30s might be willing to donate or lend them. I have been interested for a while – since starting this project really – in what the Kitchener men might have chosen to bring to Britain with them. Many of us have assumed, I think, that they were not able to bring very much, yet witness accounts and interviews suggest otherwise and describe many trunks and boxes on trains and on the dockside. Some families still have storage receipts and invoices because, it would seem, not everything could be housed at the camp in the luggage stores. Our fathers and grandfathers were certainly restricted in what they could bring out, but there do not seem to have been many restrictions on how much they could leave with in terms of unrestricted terms – as long as they could afford the shipping and storage costs, presumably. In the case of Werner Weissenberg, he brought out quite a number of things that we still have, but perhaps most notable was his collection of books. I think he must have packed just about every school and university book he’d ever owned. A few are shown below. 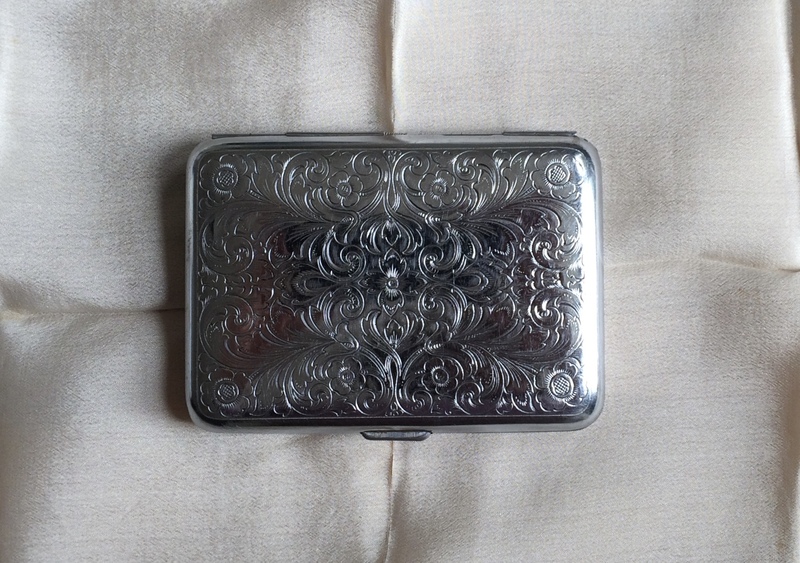 We heard recently from an American gentleman whose father and uncle were in Kitchener. He has sent in a remarkable set of materials, including a diary account of Peter Weiss’s escape to Belgium, Kitchener, and the USA. Trying to find some records for the family at the UK end of things, I looked up the ship list of names for the men’s sailing to Canada in 1940, when I realised just how many other Kitchener men were sailing on the same ship – the Cunard White Star – Antonia. In fact, the father of a family from whom we have already heard was on the same ship. In turn, this led me to wondering whether it might be possible to establish some clearer idea of how many Kitchener men actually made it to Canada and the USA – using these ship lists. It’s not going to be quick or straightforward, because the transcriber of these lists has obviously not regarded ‘Kitchener’ as being of sufficient significance to digitise the place name, so it will be a matter of going through many lists by hand. 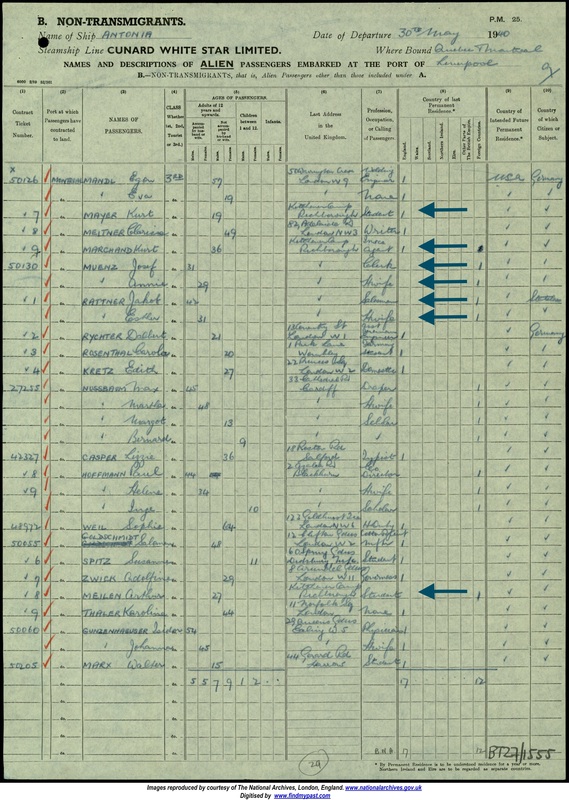 However, this will provide an interesting means to cross-check the Kitchener list that we have – the 1939 Register. 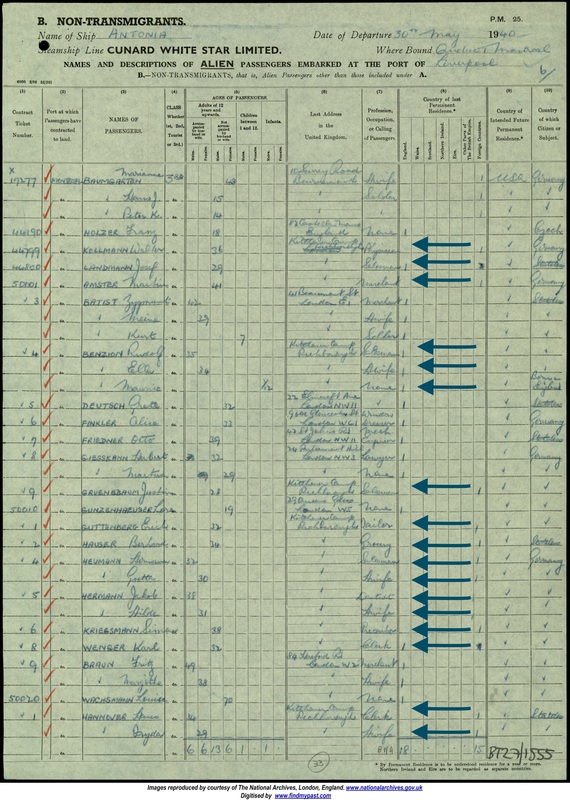 The Register is the closest thing we have to a list of (what we assume is) a majority of Kitchener names – although we know it is incomplete because families have got in touch with documentation, asking why their fathers, uncles, or grandfathers are not on ‘the list’. It’s all fascinating stuff and – once again – this is history in the making: made possible by the many Kitchener descendants who are getting in touch. © Art.IWM ART 15989 20: All Rights Reserved except for Fair Dealing exceptions otherwise permitted under the Copyright, Designs and Patents Act 1988, as amended and revised. Non-commercial use. Tickets for this talk at the link below – all welcome! With the outbreak of war in 1939, all Germans and Austrians resident in Great Britain became ‘enemy aliens’. Initially reluctant to intern these individuals, the British government instituted a series of tribunals in order to ascertain which enemy aliens were truly ‘dangerous’, and which of them were genuine refugees. With the swift fall of France and the Low Countries in May 1940, public hysteria led to calls for mass internment in case there was secretly a ‘Fifth Column’ of foreign spies and saboteurs. The vast majority of those interned in Great Britain during the Second World War were refugees who had fled religious or political persecution before the war. Arrested by the police, sent to hastily constructed transit camps at racecourses, unfinished housing estates, or in one case an abandoned factory, and then moved to the Isle of Man, Australia, or Canada, internment was a traumatic experience for those involved. Additionally, those who wanted to fight against Nazism were initially denied this opportunity, leading to much frustration, as well as unnecessary hardships caused to individuals and families already suffering displacement because of Nazism. Almost as soon as the policy of mass internment was instituted, it was decided to reverse the policy because of the numbers of refugees involved. Campaigns by refugee charities, prominent MPs, and public discovery of the most controversial aspect of internment – transport abroad – led to the start of the release process. Release was often slowed down due to bureaucracy and was significantly more challenging for those internees who had been deported to Canada and Australia. Despite all these trials and tribulations, the internees made the most of their situations and created thriving environments despite their lack of resources. One of the most saddening documents I have encountered is a list of Kitchener men’s wives and children – those whom the organisations had still not managed to rescue when war broke out. I think there were over 600 names on that list. 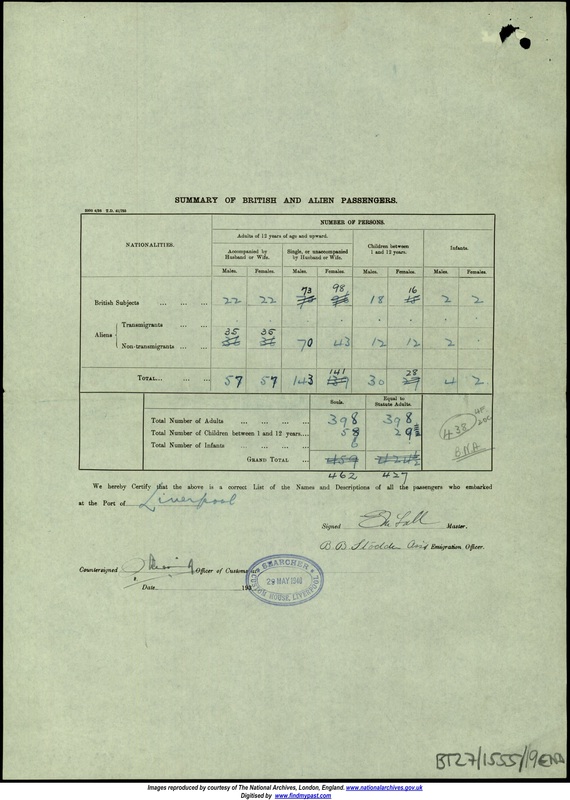 The pencil marks on the document show the painstaking work of the researcher who found this – who must have worked for a long time to try to discern who was still alive at the end of the war. 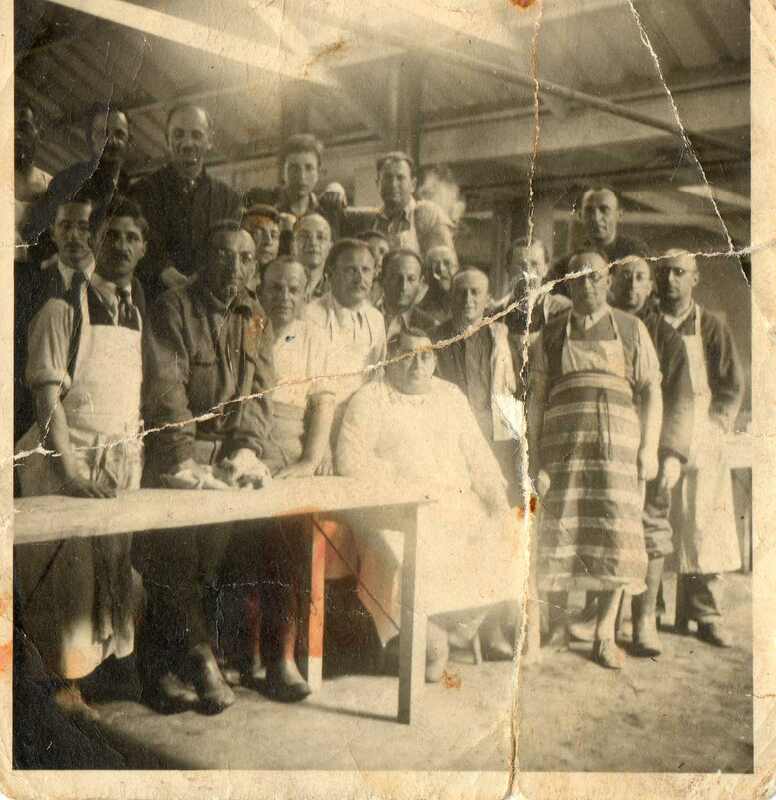 The dreadful reality is that few of these women and children survived the Shoah. Most of us, myself included, will have grown up without grandparents, but seeing a long list of hundreds of children’s names was something else again – reminding us of why this commemoration is so very important. 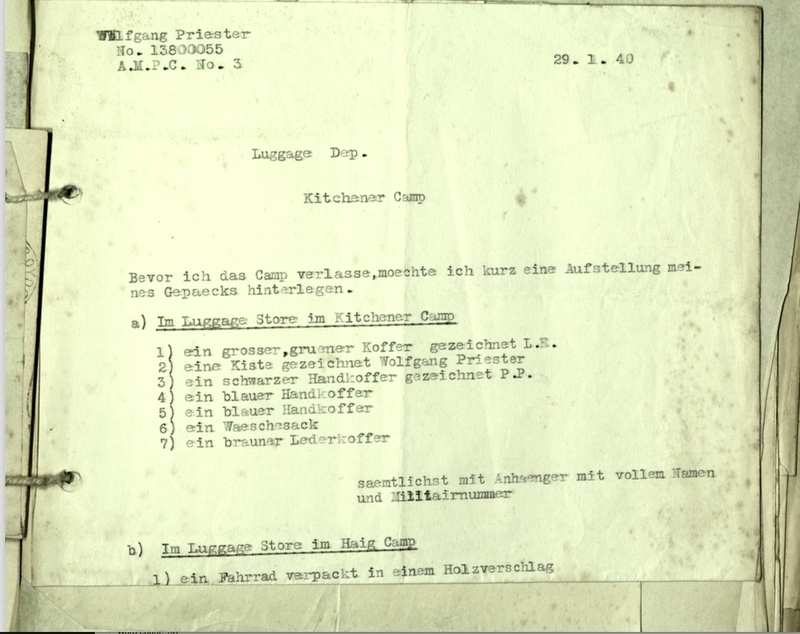 I was recently doing some more work on our various lists of names that are coming to light in the course of the Kitchener project, one of which was sent in by a Berlin ORT family. We have had several families get in touch whose relatives were at the ORT. And I gradually realised that a couple of these had also been on HMT Dunera. 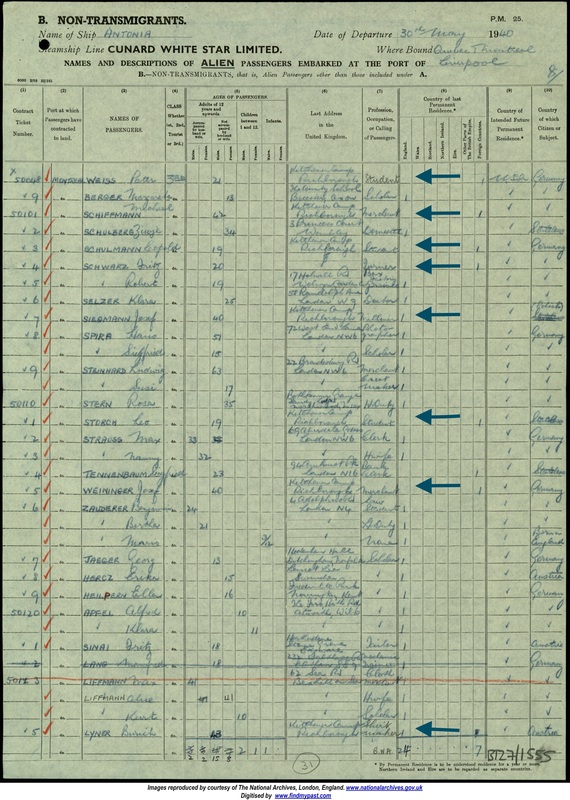 One day, just out of curiosity, I started what I assumed would be a fairly quick task – to compare the list of ORT boys’ names we had been given with the National Archives records of who was deported to Australia on the Dunera. My apologies, but I can’t reproduce the list of names on the website because of data protection issues, given the boys’ years of birth. Many hours later, I finally looked up – immensely saddened again by what I had learned. That of the 98 names listed for this photograph, almost unbelievably, over 30 of these youngsters were deported on that hellish voyage in summer 1940. This is a post for Kitchener descendants in the USA. A number of you have asked whether I can put you in touch with each other – so you can perhaps organise a meet up of some kind. I have gone through many emails, and done a search for some basic terms, such as US, New York, and so on, but my email search isn’t terribly sophisticated and, in any case, not everyone tells me what country they live in. I am about to send out an email to those I have located in this fairly quick email search, but my sincere apologies if I miss you out – it won’t be intentional. If you live in the USA and would like to be able to make contact with other Kitchener folk there – perhaps with a view to meeting up in some form – please email me to let me know – and I will add you to the list for you to circulate amongst yourselves. I will then distribute email addresses and names only among those who have emailed to say they would like to do this, and I will then leave you to it from there. If there are a few of you, you might want to get in touch with somewhere like Leo Baeck or USHMM (depending on where most folk live) – they may have a space they would let you use that might feel appropriate to the topic. That brief suggestion aside, I’ll otherwise leave you to it – because, as you will know – we’re not a formal (or funded!) group in any way, shape, or form. 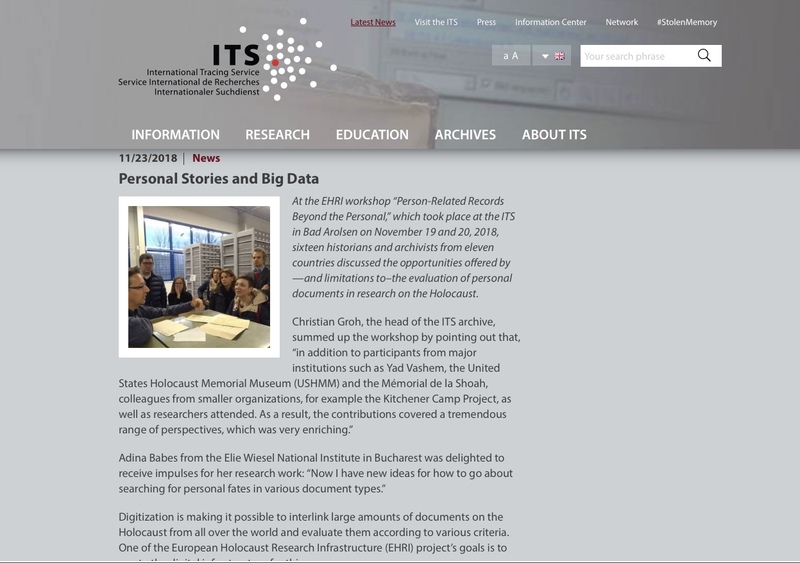 We thought you might like to see this image – a screenshot from the website of the International Tracing Service at Bad Arolsen – please click to enlarge. A lovely mention for our Kitchener Camp project! Congratulations to everyone involved. We know it takes a lot to put your trust in the project and to send in family materials and narratives. But, as this shows, it is starting to get the Kitchener history better known, and we hope that helps to make it feel worth the effort.